Clothing relabelling – What options are there? When you’re thinking about getting custom clothing, we all look for the best ways to ensure that the clothing we’re getting is fully personalised. Usually, this stops at getting custom printing on the front or the back of the T-Shirt, but it’s rare that people or companies will go the full distance and relabel their clothing. When you’re creating your own clothing brand or even buying printed T-Shirts, a great idea to go the full distance and create a truly custom experience is to replace the labels that are found inside the T-Shirts with your own custom printed labels which show off your brand and your clothing brands logo. By doing this, you’re adding your own unique element to the clothing. With printing you usually select your clothing from a specific brand – such as Fruit of the Loom – and then the T-Shirt will be printed but it will still carry the Fruit of the Loom logo on the inside of the T-Shirt. By keeping the original label, your garment loses a lot of the “unique” brand feel that buying custom clothing from a bespoke fashion label can bring. A simple T-Shirt relabelling job which removes the original labels and adds your own custom clothing labels is a brilliant way of adding a seal of quality and ensuring that you receive constant brand recognition as well as adding extra value to your products. Labels can also be used as valuable advertising space as you can customise the labels to include important information such as your company’s website so your customers will always know where to go when they’re looking to place new orders. At Garment Printing, we can use a number of different techniques to ensure that all of your garments are finished to an exceptionally high standard and they can be completed during the T-Shirt printing process. 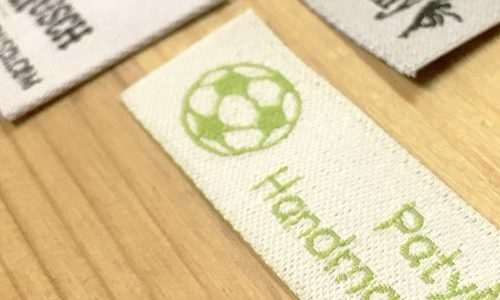 The simplest form of relabelling is by removing the original neck tag, which is found on the inside of the T-Shirt, and replacing it with a custom designed label which is then sewn either under or on top of the neck tape. We can also use the existing care labels which are found on the inside of the T-Shirt to provide the sizing, country of origin and all necessary care-for instructions which are required by law. This leaves the replacement label free to represent your brand and advertise your company to your customers. So, let’s discuss some of the different relabelling options which we’re able to offer. Satin printing is a popular option for relabelling T-Shirts, hoodies and sweatshirts. It allows you to fully rebrand the product while ensuring that it remains stylish and comfortable at all times. Satin labels are an excellent option for those planning to use small text which wouldn’t be visible on other options. The satin leaves behind a soft finish which stops running and reduces irritation to the back of the neck and it is an incredibly popular choice amongst many high street brands. Another reason why these labels are so popular is because we’re able to print up to four different colours on them meaning that you have more options to fully customise the labels. Another option is to use woven satin labels. These tags give your garments and more sophisticated look from the inside out. With woven satin labels you can use up to four different colours but it’s usually only advisable to have two colours at any time. This is because, the more colours in the material, the bigger the label will become and this could lead to it feeling bulkier and it won’t retain the comfort as much. Similar to woven satin, woven damask is a unique way of weaving your labels to create a unique look and feel which retains a sophisticated and stylish brand. The damask material is designed so that it’s softer than satin and provides a more comfortable feel and still manages to provide high-quality definition. If you’re considering using smaller text within your label and want to maintain the comfort and durability – choose woven damask. If you’re planning on re-labelling smaller quantities of T-Shirts, there are more options available for relabelling the T-Shirts which can still produce a high quality finish and help you with your brand recognition. DTG is a process which involves printing the ink directly into the fabric of the T-Shirt. It uses specialised machinery which can easily print your label directly into the T-Shirt and it gives a fully customised feel as you can add all of the content that is important to your brand. There is no minimum quantity to DTG printing and it’s a fantastic option for white garments and for logos without small text. With transfer printing our team of experts are able to carefully and precisely cut your chosen label down to the size that you want and then print this onto the inside of the T-Shirt using the transfer printing technique using specialist materials and heat to ensure that it won’t peel away over time. The technique is perfect for orders of a small quantity and also if you’re using labels which boast intricate designs. Another benefit of using this printing technique is that you can attach the words to any colour background and make them stand out. If you’re using a specific Pantone colour scheme and you would like this matched throughout the T-Shirt designs then screen printing is the perfect technique for you. It boasts a similar feeling to that of DTG printing and the ink is directly applied into the fabric of the T-Shirt to provide a smooth, irritation free finish and it also provides excellent definition. Screen printing is also highly recommended if you’re thinking about relabelling sports clothing. For more information about our excellent relabelling service or if you want a full insight into the different customisation options that are available – check out our relabelling service or get in touch with our sales team now.